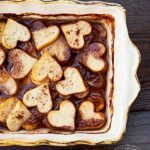 These clean eating Valentine’s Day maple baked sweet potatoes are perfect for celebrating love! It’s funny. When my marriage ended, I figured I’d be a big ol’ Valentine’s Scrooge for years to come. But once I got past the ickiness of it all, I realized that I have an even greater reason to celebrate a day dedicated to love. Mini Chef!! There is truly no greater love than the love felt by a parent for their child. It’s falling in love in a way you didn’t think possible. Loving another person beyond all explanation or reason. It’s a powerful and incredibly moving type of love. Mini Chef is in grade school now, and Valentine’s Day is becoming a bigger deal. This year, we are keeping things sort of low key and at home. And to help celebrate a home-style Valentine’s Day, I’m also busy thinking of a few extra ways I can show him how loved he really is. Mind you, heart-shaped food doesn’t even begin to cover it. But it’s a fun way to remind him I love him. Not just today, but always. Forever and ever. And isn’t that what Valentine’s Day is really about? Because there can be such large variances in the size of sweet potato you purchase, your yield may be very different from mine. So this is one of those recipes you will have to “eyeball” a bit. I purchased 1 very large sweet potato. The trick is to look for a sweet potato with lots of girth. A really, really fat one. The long skinny ones will make this harder to do. Mine was just under a pound. Once I sliced it and cut out the hearts, I weighed the hearts and found that I had 10 1/2 ounces. This recipe reflects that measurement, so please adjust up or down depending on how much you end up with. You will need a small, heart-shaped cookie cutter. I found my hands got pretty sore trying to press the cutter through the tough sweet potato, so I folded a square pot holder and used that as a cushion. Worked great! Please also note this is definitely a sweet dish. Mini Chef took one bite and said, “Mmmm! Baked apples! 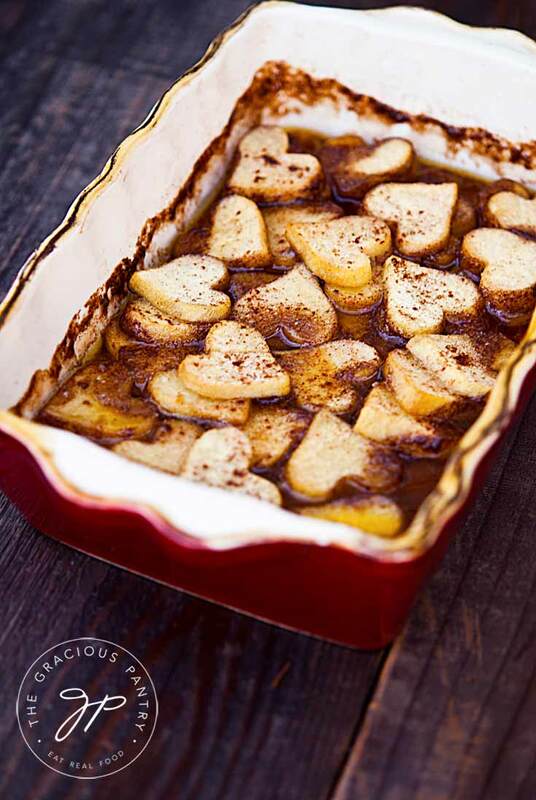 !” So ya, these clean eating Valentine’s maple baked sweet potatoes were a hit to say the least! A wonderfully tasty way to show somebody you love just how you feel! Peel and slice your sweet potato. I recommend no thicker than 1/4 inch. But really, more important that thickness is that all the pieces are uniform in thickness, otherwise they won't all bake at the same rate. In a pot, melt the butter and mix in the maple syrup, cinnamon and salt. Place the sweet potato hearts in the pot and stir to coat the hearts. Pour into a small casserole dish and bake at 350 F. for approximately 30-40 minutes or until the potatoes are soft and cooked through. Allow to cool a bit, salt as needed and serve. From the Gracious Pantry archives: Originally posted 2/7/14. Julie – 30-40 minutes or until cooked and soft. 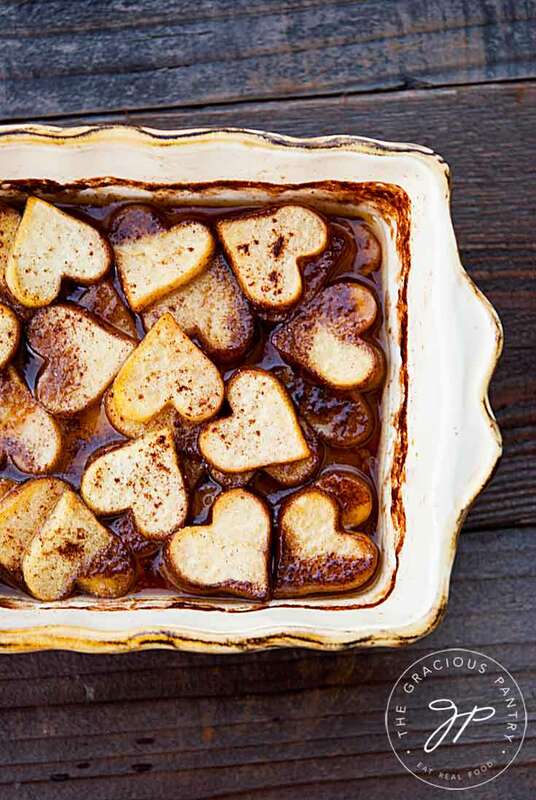 These heart sweet potatoes are some of the most adorable recipes I’ve ever seen! So sweet. Little heart faces. And yes, the love for a child is ridiculous! I keep having to remind myself though, that if I really love my 2 year old, I will discipline her no matter how cute she is. This dish looks sinful. It almost reminds me of a dessert-style scalloped potato dish. I would imagine this would be great around Thanksgiving as well. Can’t wait to try this! You could use one apple cut into pieces and less of the maple syrup to cut the sweetness. Also tastes very good.